We decided to take a day off from skiing today and do a little shopping and goofing off. We checked out some real estate in the north end of Teton Valley and then we had a little lunch at Milk Creek Grill in Driggs. 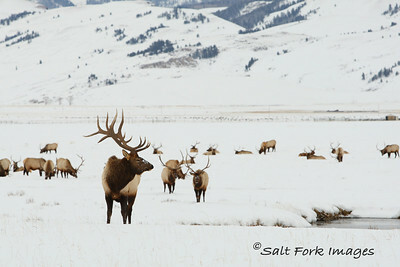 Afterward we headed over Teton Pass to Jackson, Wyoming, where we took a sleigh ride in the National Elk Refuge. The National Elk Refuge is located just north of the Town of Jackson and consists of almost 25,000 acres of valley floor where migrating elk spend the winter. As Jackson Hole was settled in the late nineteenth century, the traditional migration path of the elk from their summer range on the Yellowstone Plateau to lower valleys below Jackson Hole was cut off. The Refuge was established in 1912 to protect the Jackson herd and to provide a place where the herd could be fed through the toughest winter months. The number of elk on the Refuge varies from year to year from around 4,000 to around 8,000 depending on weather and range conditions. Our sleigh ride started about 2:30pm with Steve at the reigns and Burt and Ernie in the harness. 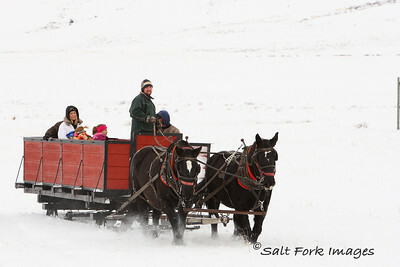 There were at least two other sleighs loaded with tourists on the Refuge at the same time. Here's a shot of one of the other groups. Our timing must have been good because a lot of the bulls were up and moving around. It was amazing to be so close to these majestic beasts. In some cases our sleigh passed within 20 feet of the wild animals without spooking them or distressing them in any way. Steve told us that many of these elk had been on the Refuge every winter for their entire lives and that they were very accustomed to the horses and the sleigh. He also assured us that if anyone were to get out of the sleigh then the elk would immediately leave the area. That would be something different (and spooky) for them. 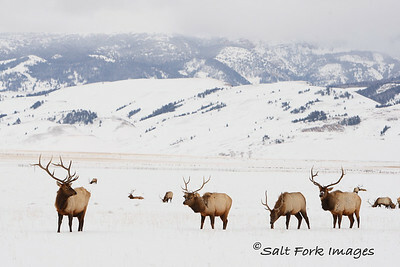 Photographing these elk was a treat for me. First, as many of you know, I love to hunt. I have never hunted elk before and this experience only served to reinforce my desire to do so. Second, I love to photograph any kind of North American game animal. The elk is such a majestic creature and these bulls are the epitome of the species. And third, shooting in the snow is a special kind of challenge. The light meter built into the camera sees a lot of white that it wants to make into gray. It tries to close itself down and in the process it turns these beautiful snowscapes into the dreariest of scenes. Every shot had to be overexposed by at least one and a third stops. If it was a wide shot with mostly snow then it was overexposed by two full stops to make it work. 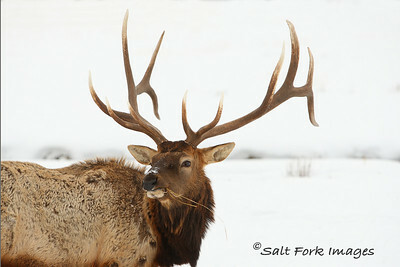 If you are ever in Jackson Hole in the winter, I highly recommend the National Elk Refuge. I hope you enjoy my photos. These photos are great! 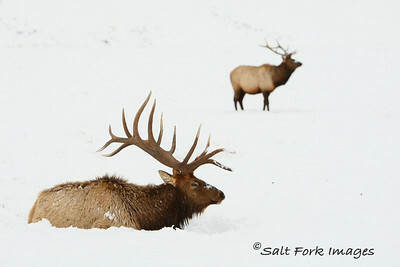 I love the huge bull elk and the snow background. Thanks for sharing and giving us some points making photos in the snow. Your photos were great! 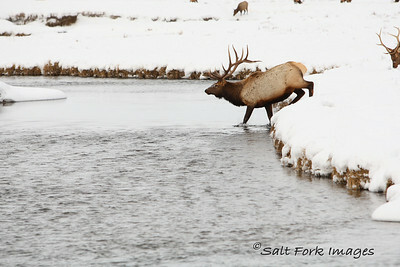 My family also visited the Elk Refuge just a few days after you. We were there December 31, 2010. It was amazing to see that many elk in one place. Would have enjoyed it much more if the temp had been above zero! !